Capt. 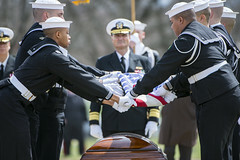 Thomas J. Hudner, Jr., a naval aviator who earned the Medal of Honor during the Korean War, was laid to rest with full military honors, April 4. 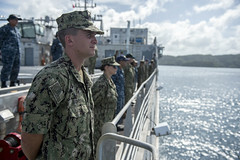 After the arrival of the expeditionary fast transport ship USNS Brunswick (T-EPF 6) the previous day, Pacific Partnership officially kicked off in Palau, April 4. 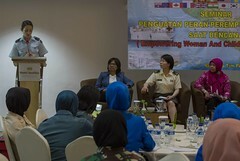 The three-day event in Indonesia that kicked off April 3 was created to spark discussion about ways to enhance crisis response. 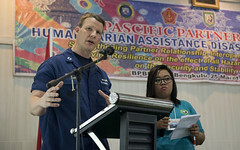 The mission team and local officials gathered in Bengkulu, Indonesia, April 3, to discuss disaster response. 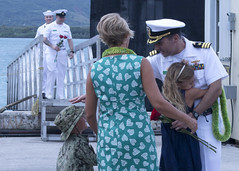 The Los Angeles-class attack submarine returned to its homeport in Guam, March 30, following a three-month forward-operating period in the Western Pacific. 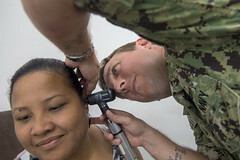 Throughout April, the Navy joins the nation in observing Sexual Assault Awareness and Prevention Month (SAAPM). 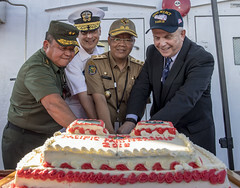 The Pacific Partnership 2018 mission in Indonesia officially kicked off with a two-part opening ceremony ashore and aboard USNS Mercy (T-AH 19) in Bengkulu, April 2. Ships of the Theodore Roosevelt Carrier Strike Group arrived in Singapore for a port visit, April 2. The first phase of Pacific Partnership 2018 concluded aboard USNS Brunswick (T-EPF 6) in Yap, Federated States of Micronesia, April 1. USS Mississippi (SSN 782) returned home to Joint Base Pearl Harbor-Hickam, March 30, following a six-month Western Pacific deployment.